Getting the correct tee height with your driver this time of year can be crucial to keeping your drives straight and in play. This is down to having the incorrect tee height, which will generate more spin, especially into the wind. The first thing people tend to do when it is blowing a gale straight into your face is to tee it lower to keep the ball lower. However, this is most definitely not the case. In fact, you will most likely hit the ball higher or worse majorly offline due to the increased amount of spin produced from a bottom strike on the clubface. As you can see from the image below, this is a perfect example of the golf ball being teed too low. 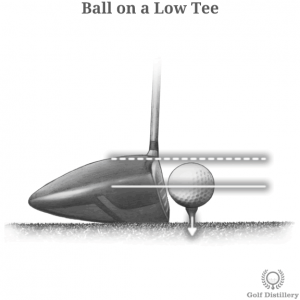 As you can see from the image below, this is a perfect image of how high you should tee the golf ball up. 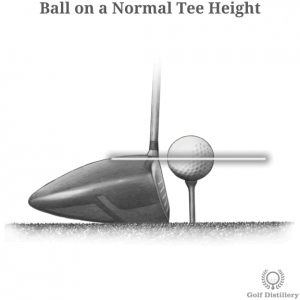 When the golf ball is teed up at the correct height, there should be half the golf ball showing above the top line of the driver and half the golf ball in the clubface of the driver. This will promote you to hit up on the driver, which if you’ve read one of my previous blogs about “Spin Loft” you will know this is a good thing especially into the wind (If not, go back and read it. I posted it on Nov 10th 2017). Also, you will maintain a lower spin rate when hitting the ball higher in the face compared to lower. You should also make sure that you have the golf ball in the correct position with your feet, otherwise, this can also increase the spin rate with your driver as well as send it too far left/right. Read my next blog, to find out where and how we should be positioning the golf ball in our feet. If you require any more assistance on gaining more control with your driver, straightening your tee shots up or just want a general overview of your tee shots. Then please don’t hesitate to contact me on 01983 613131 and book yourself in for a golf lesson today. Also in January we are doing a block booking offer, where if you purchase a block of 4 x 45 minute golf lessons, which can be taken any time suitable for you. You will receive DOUBLE RANGE CREDIT! Offer ends January 31st 2018. Thank you very much for reading my blog, my next one will be along shortly. Have a great week golfing.